Outstanding Educational Resources and Forensic Links. The aim of this page is to showcase the very best forensic science and educational resources available over the Internet. Some of these resources will have been featured on our forensic science blog, some will be resources that we have come across in our teaching and research; and some of the resources will have been discovered in the course of putting the forensic science website together. This page provides a single reference point for anybody looking for outstanding forensic science and educational resources; and in the best tradition of learning, every resource featured on this page can be accessed completely free of charge. We will be adding additional hand-picked educational resources to this page in due course. Find out about the history of forensic science from evidence of fingerprints in early paintings & rock carvings made by prehistoric humans right through until modern day. This great on-going project is available in both graphical and text form. Click Here To See The Forensic Science Timeline. Visible Proofs: Forensic Views of The Body is a fascinating exhibition about the history of forensic medicine. As the exhibition description notes - over the centuries, physicians, surgeons, and other professionals have struggled to develop scientific methods that translate views of bodies and body parts into "visible proofs" that can persuade judges, juries, and the public. In the galleries you can explore significant cases, technologies, and people that have had an impact on the history of forensic medicine. Visible Proofs: Forensic Views of the Body is located on the first floor of the National Library of Medicine at the National Institutes of Health in Bethesda, Maryland. The exhibition is open to the public during the Library's main reading room hours from February 16, 2006 through February 16, 2008. The admission is free and a docent-led tour is available upon request. Whether you go to the exhibition or not, make sure you visit the offical website. Here you will find three excellent online activities designed to help you learn more about various forensic developments, techniques, and careers! presents two medical examiners' perspectives on their work, first-hand experience in medico-legal autopsies, and something called Virtopsy. Explore the world of a medical examiner and consider a forensic pathology career for yourself! Introduces forensic anthropologists and their work with human remains. Examine skeletal remains, a human rights case, and three anthropologists' perspectives on their work. Offers insights into the scientific and technological advances that have extended the capabilities of forensic analysis. Examine historical developments in forensic identification, crime scene recording, DNA analysis, radiology, and toxicology. If you are an middle/high school educator this great website also has a number of lesson plans that bring the world of forensics into the classroom. As if all the above wasn't enough, this amazing site also gives you access to additional resources. These include radio interviews featuring forensic topics and web links to further online forensic activities and forensic career information. 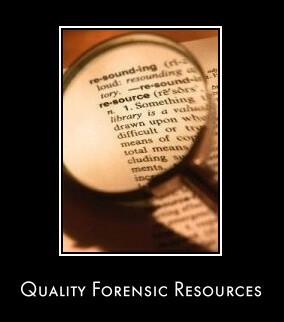 While there is no specific forensic science category you will find related material within the various topic units e.g. 'The Meaning of Crime', listed under 'Society'. If you are a student this website is worth visiting for the free study skills information alone. Click Here To Visit LearningSpace. As with LearningSpace, LabSpace can be accessed completely free of charge. Click Here To Visit LabSpace.